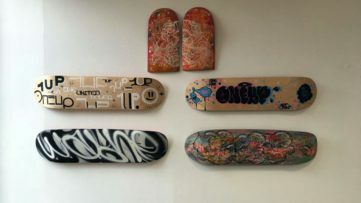 Instagram has proven to be a social media network where you can find best artworks, new emerging artists, and fascinating examples of street art. Nowadays, Instagram art is #takingover the Internet, since it has become the easiest and fastest way of sharing something you have created or seen on the streets, in the galleries, in museums, and on the walls of various buildings across the world. In the spirit of sharing (because sharing is caring), we have decided to present another Instagram art of the month top list, the list which all of you helped create by liking and commenting on our Insta posts. You will see some works from the recent Crystal Ship festival, Alexander Kaletski’s piece, and taken back to your Childhood Dreams. Before we go on to our list, make sure to follow us on Instagram for daily updates in the world of street art, and to become a part of the community that will choose the top 10 Instagram art for the following month. And now, scroll down to see the most liked artworks of the month of April! 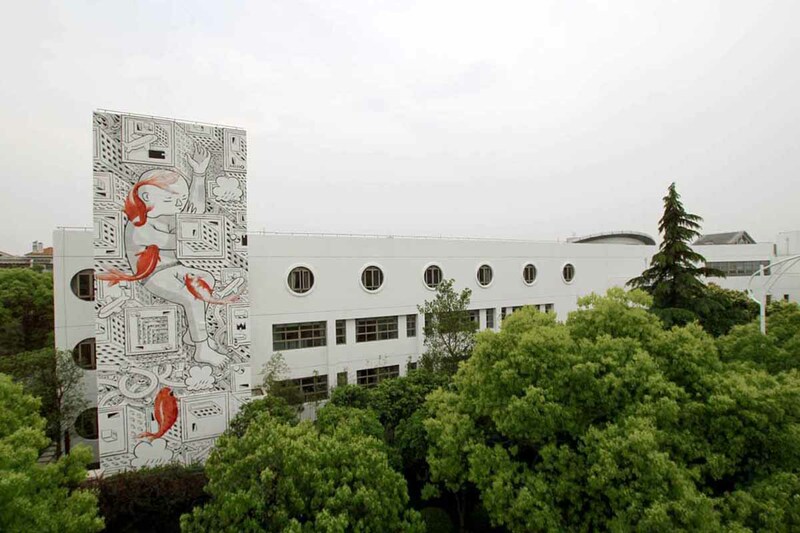 The Italian artist Millo and his large-scale mural Childhood dream have been featured in our latest Street Update, so it is no surprise that he got the spot on our list today. This piece is adorning the walls of the largest city in China, Shanghai, and thus popularizing the works of Western artists in the far East culture. This 3D-like piece depicting a sleeping boy surrounded by the tiny city (or is he an extra-large boy?) while the goldfish are swimming around him. The goldfish is a symbol of good fortune and wealth in the Chinese culture, and it can be seen in the artworks that date back to 8000 BC as well as the contemporary pieces. Mirco Marcacci is an Italian artist who lives and works in Argentina. He is the graduate of the Academia di Belle Arti di Roma, and has exhibited his works numerous times worldwide, in Brussels, Rome, Spain and Buenos Aires, among others. 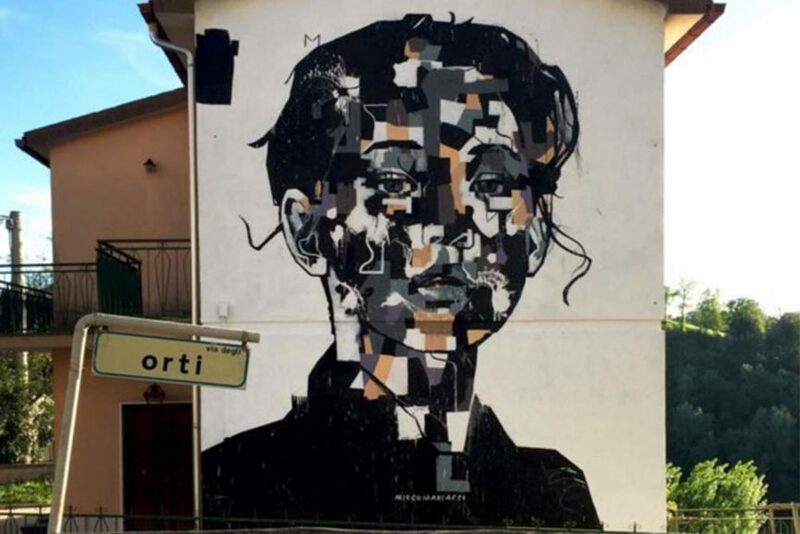 His latest piece was executed for the Pubblica street art festival in Selci in la bella Italia, and it is titled Geometria dell’Anima. Done in his signature style, this large-scale piece is a portrait of a melancholic face looking directly at the viewers, inviting them to think about the issues that contemporary life brings along, and the ever-growing detachment from the society that burdens us all. 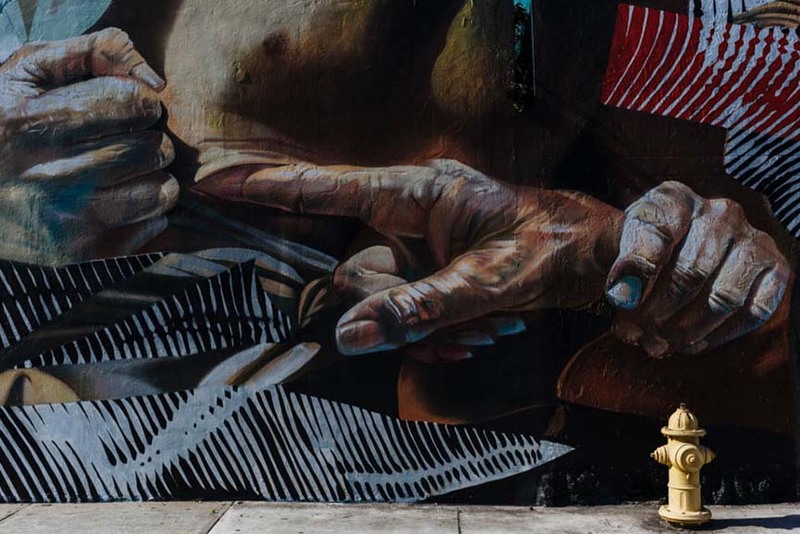 Andrew Antonaccio and Filio Galvez are a street art duo operating under the name 2Alas. 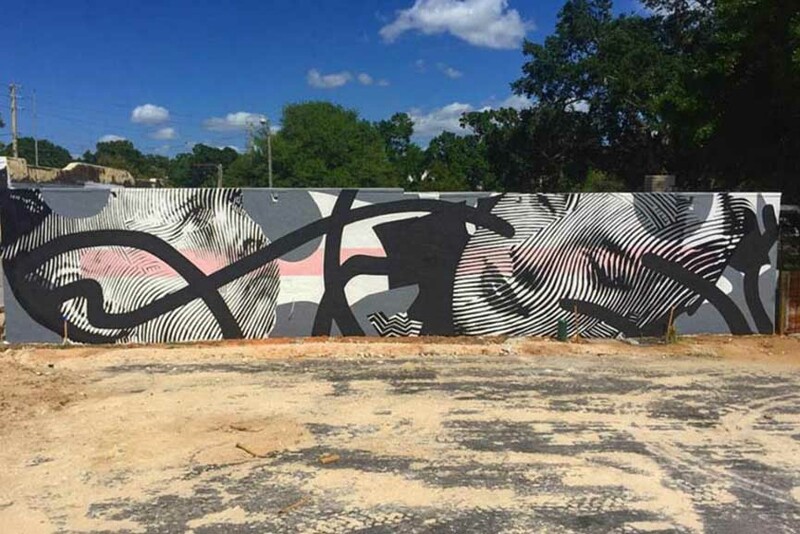 One of their latest pieces was painted in Winter Haven in Florida, and it was done in their signature style of black and white linear portraits, with the occasional pop of color here and there, making the piece flirt with the notions of Abstractionism. This mural of two faces, a child, and a woman, are, of course, painted with a myriad of curvy lines and a splash of salmon pink which overlaps the heads turned sideways. Winter Haven has become richer in the artistic sense, and 2Alas were definitely the artists who helped that. 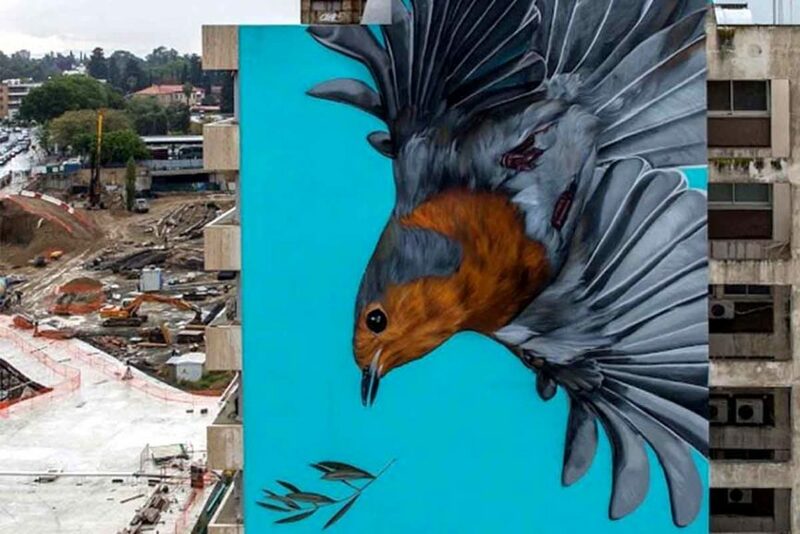 Bane & Pest have created a mural titled Comeback for the Nicosia Street Art Festival in Cyprus. 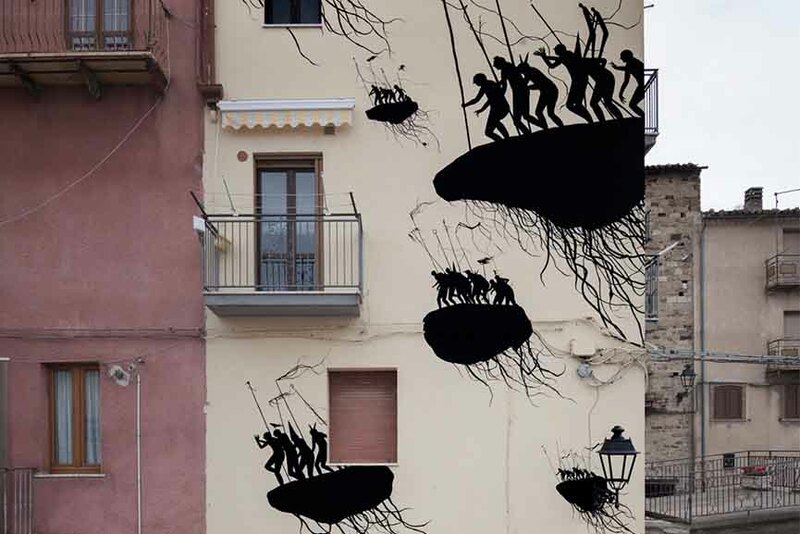 If you are by any chance headed there, make sure to pop over to Nicosia and check out this amazing piece for yourself. 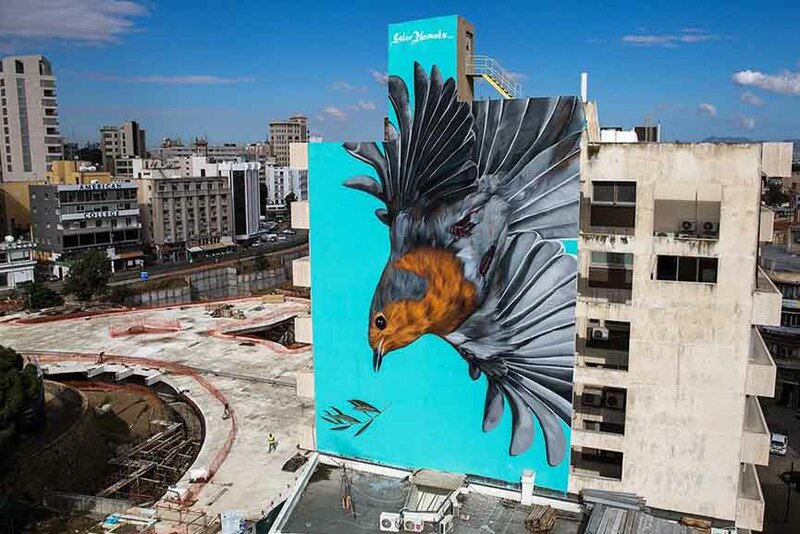 This colorful mural is depicting a bird flying down in the sky of turquoise, providing a much-needed pop of color in the overall greyish area of the surroundings. This festival is a huge step forward for the street art in Cyprus, as only a few years ago it was considered to be vandalism and frowned upon by most. 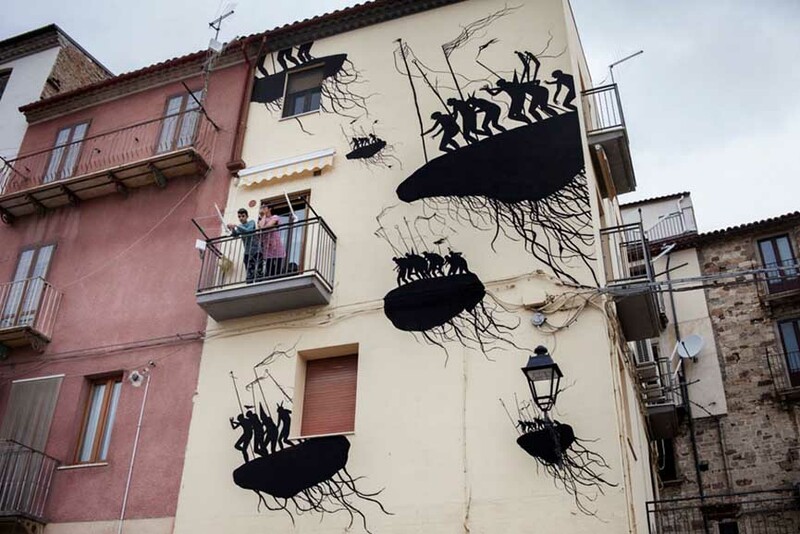 However, with the Nicosia Street Art festival, this type of art is becoming more and more accepted on the island, and nowadays, numerous murals and graffiti are decorating the island. 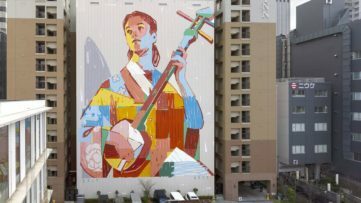 ETAM, the Polish duo comprised of Sainer and Bezt, has created a mural in Dubai titled Girl with the orange. 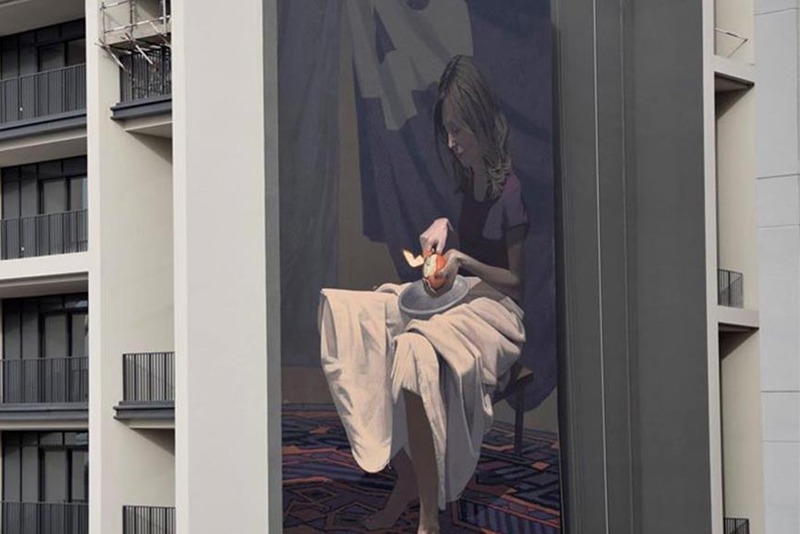 This piece is adorning the walls of Dubai and it portrays a girl peeling the fruit while sitting in the dark surroundings in her long skirt, uninterested in the hectic life in the streets bellow her. 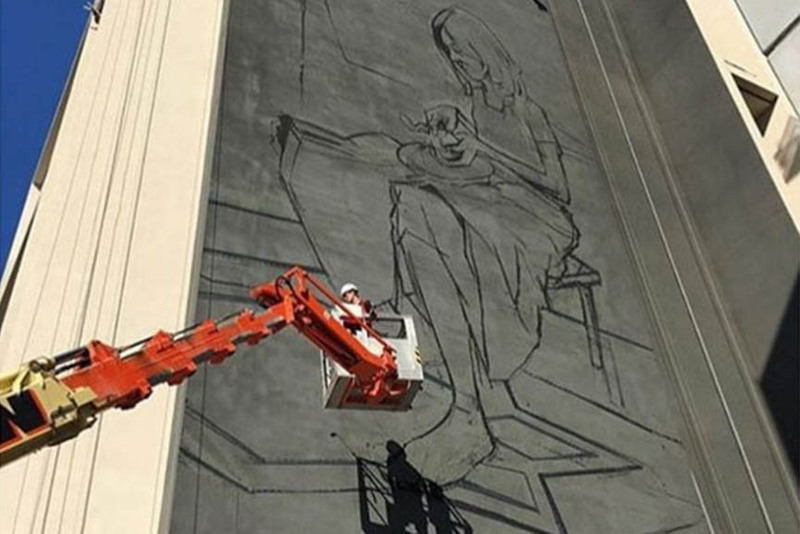 The painting-like mural of a barefoot girl with brown hair can serve as a reminder that we should probably slow down with our faced-paced lives and take some time for ourselves, if only for a little while. So if you’re ever in Dubai, take a few minutes to appreciate the beauty of this piece, and forget about that thing you are late for. You need to take a break, just like the girl in the mural. 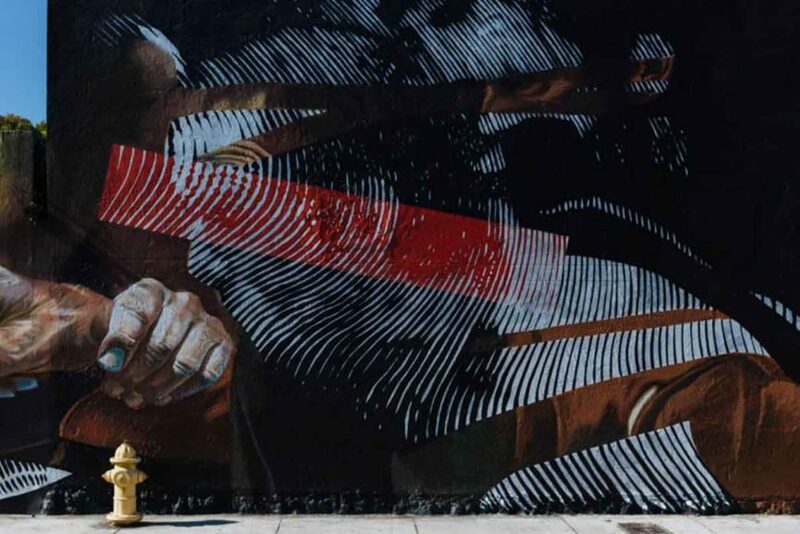 Andrew from 2Alas and the Frankfurt-based graffiti artist, Case MaClaim, have painted a mural inspired by the great master, Caravaggio, and his famous 16th-century piece The incredulity of Saint Thomas. 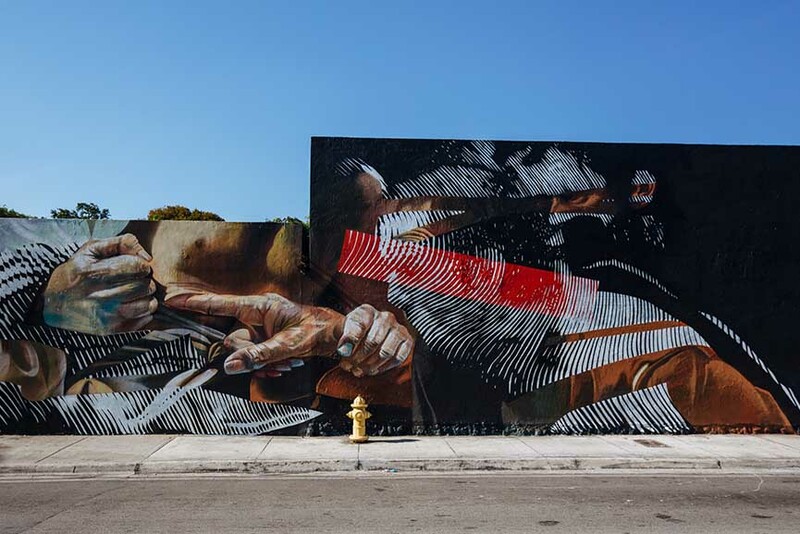 This collaboration of two artists resulted in the amazing mural that combines the styles of both artists, creating a distinctive blend of abstraction and realism. 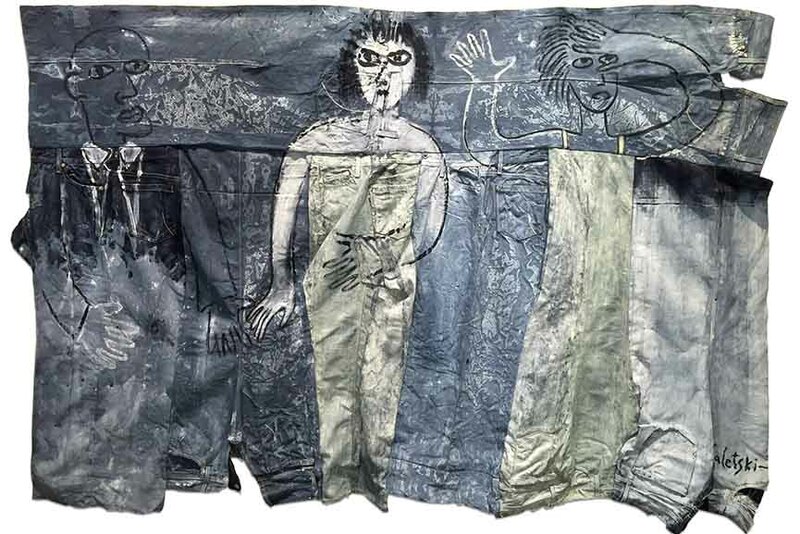 The piece portrays the disfigured portrait done in dark colors, typical of MaClaim, interrupted by light hues of geometric designs, a signature of 2Alas. The mural was done for the Little Haiti Mural Project, dedicated to the beautification of the Little Haiti neighborhood in Miami. The Spanish artist David de la Mano’s famous imagery is now adorning the walls of the small, almost abandoned village of Civitacampomarano in Italy. 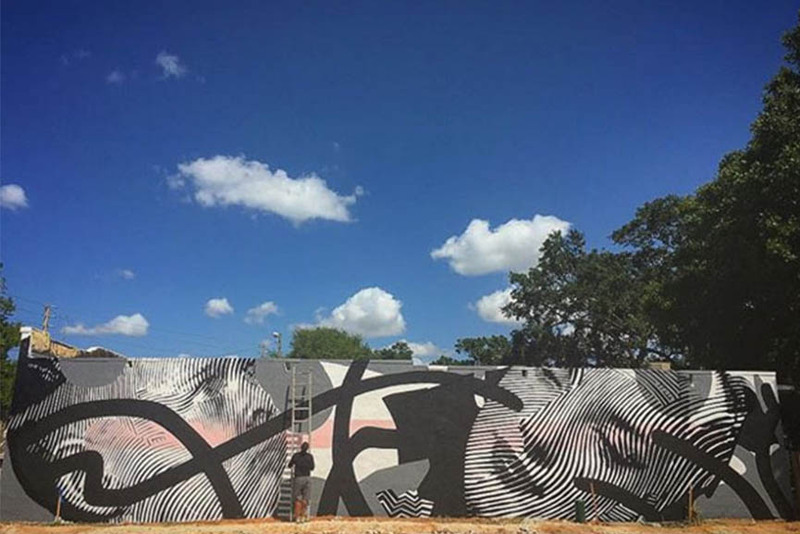 The artist participated in CVTA Street Fest and painted the large-scale mural on the side of a building in the village, done in his signature flowy style with only black paint. 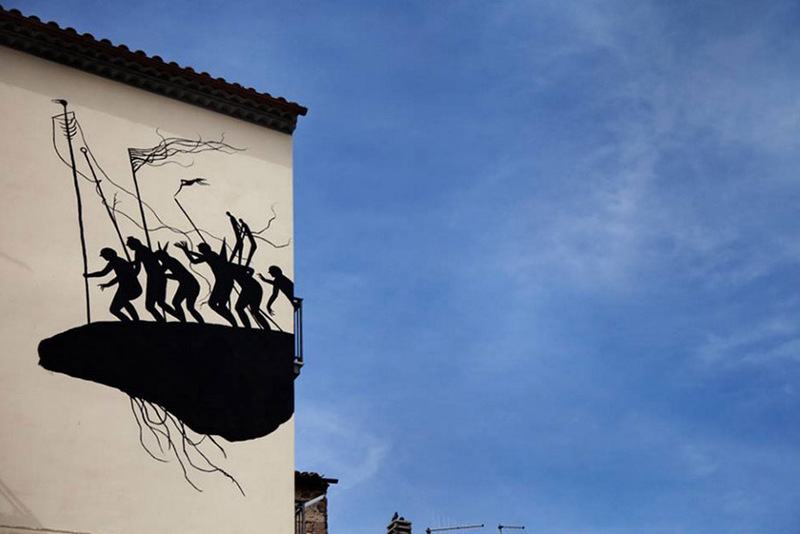 The Salamanca-born artist is famous for his public art pieces, as he has been focusing on murals since 2008. His works can be seen on the streets of Norway, Spain, Italy, France, Poland, England, Brazil, Argentina, and Peru, among others. He has exhibited his art worldwide, in Paris, Cardiff, New York, Los Angeles, Berlin, Madrid, Warsaw, and London, if we were to name a few. 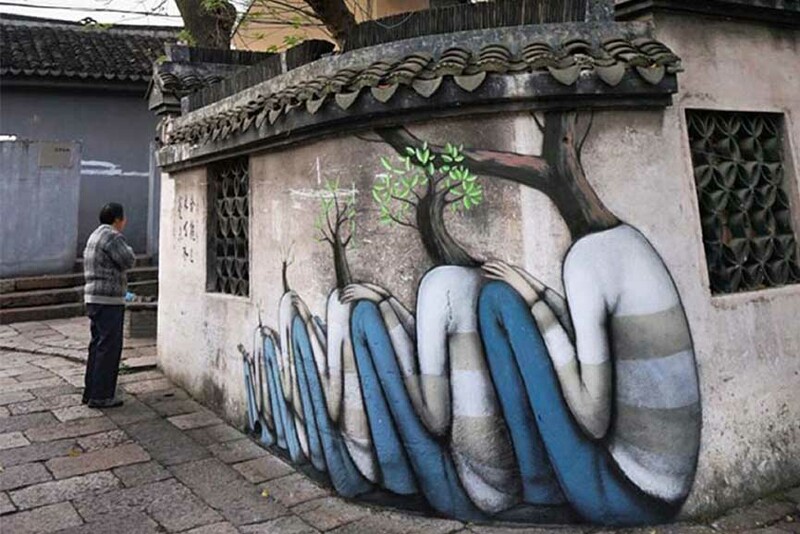 Julien Malland, aka Seth Globepainter, is a French artist who produced a few amazing murals in China during his recent travels across the country. 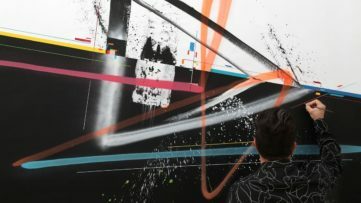 The Paris-born artist has chosen to depict children in various situations, inspired by the environment he was painting in. Seth Globepainter aims to inspire an artistic dialogue among his viewers and critics, and he has taken upon himself to get familiar with cultures different from his own by traveling and discovering how people perceive art and creativity in faraway countries. 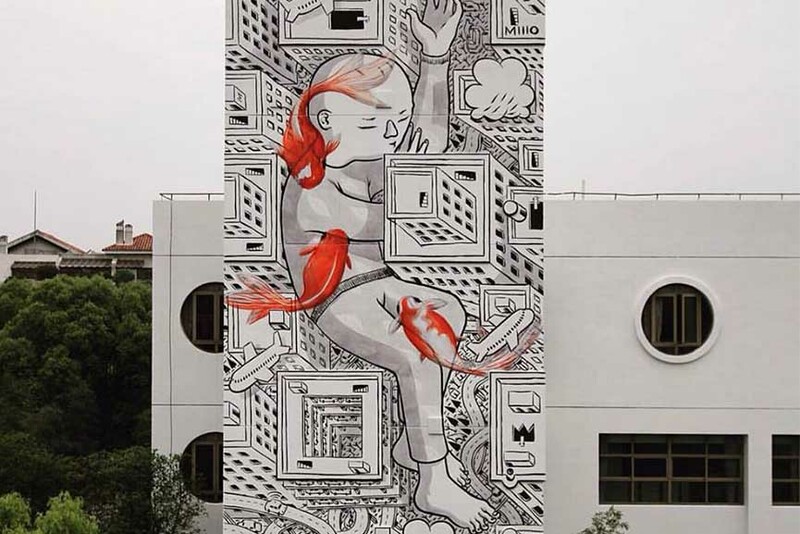 The children in his murals are connected to their surroundings, and they seem incorporated in the overall feel of the place he is painting at, creating artworks that are not only beautiful, but that carry a strong message as well. Colin Christian’s piece Trypophobia, executed in 2015, is a part of an upcoming group exhibition at Stephen Romano Gallery titled The End of Things. 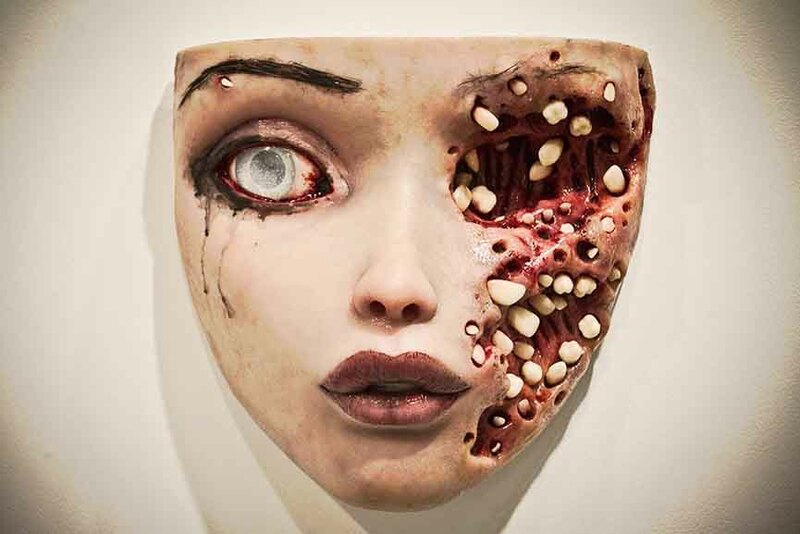 Colin Christian is a London-born artist who does not shy away from creating shocking and disturbing art, as proven in this piece that occupies the first place on our list. For all of the people unfamiliar with the term trypophobia, it is a name for an irrational fear of irregular patterns of clusters of tiny holes and bumps. This uncomfortable feeling we get when faced with inexplicable holes and punctures, especially on the human body, are the things that have inspired this artwork, scaring some, and leaving many in awe.